Kidneys are responsible for cleaning up the body. They are critical for production of Vitamin D, red blood cells and hormones to regulate blood pressure. 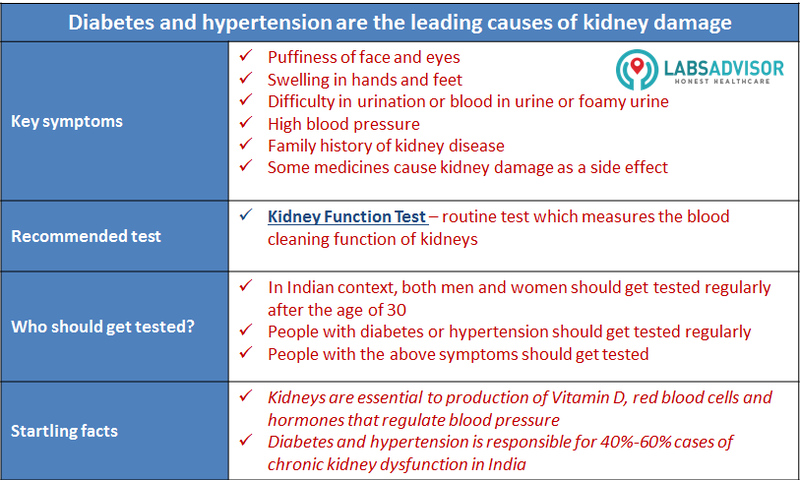 Diabetes and hypertension are the leading causes of kidney failure in India. Hyperchloremic acidosis (loss of HCO3- due to diarrhoea or renal tubular acidosis with compensatory increase in chloride). Stimulation of respiratory centre (drugs, hysteria, anxiety, fever, hyperventilation) causes loss of CO2 and decrease in HCO3-, with compensatory increase in chloride. Depression of central nervous system (CO2 retention), with increased CO2 and HCO3- and compensatory decrease in chloride. Pulmonary disease (CO2 retention), with increased CO2 and HCO3- and compensatory decrease in chloride.